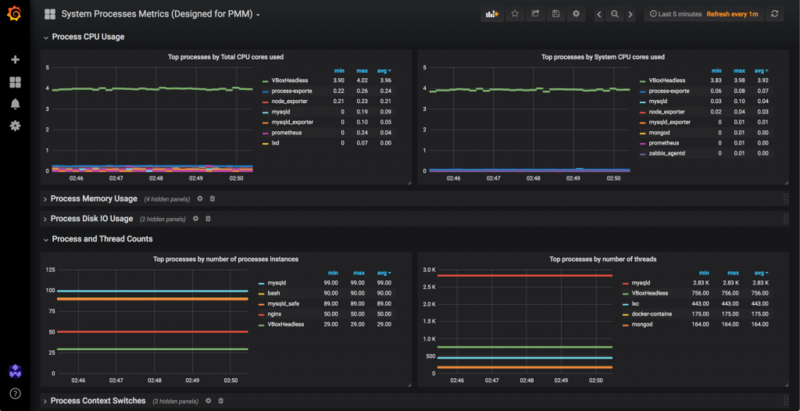 If you have set up per-process metrics in Percona Monitoring and Management, you may have found yourself in need of tuning it further to not only group processes together, but to display some of them in isolation. In this blogpost we will explore how to modify the rules for grouping processes, so that you can make the most out of this awesome PMM integration. This is an internal testing server we use, in which you can see a high number of VBoxHeadless (29) and mysqld (99) processes running. All the metrics in the dashboard will be grouped by the name of the command used. But, what if we want to see metrics for only one of these processes in isolation? As things stand, we will not be able to do so. It may not make sense to do so in a testing environment, but if you are running multiple mysqld processes (or mongos, postgres, etc) bound to different ports, you may want to see metrics for each of them separately. The general format of the -config.path YAML file is a top-level process_names section, containing a list of name matchers. […] A process may only belong to one group: even if multiple items would match, the first one listed in the file wins. In cmdline we will need the regular expression against which to match the process command running. In this case, we made use of the fact that they were using different ports, but any difference in the command strings can be used. The last rule is the one that will default to “anything else” (with the regular expression that matches anything). The default rule at the end will make sure you don’t miss any other process, so unless you want only some processes metrics collected, you should always have a rule for it. In case all these generic information didn’t make much sense, we will present a concrete example, hoping that it will make everything fit together nicely. In this example we want to have the mysqld instance using the mysql_sandbox16679.sock socket isolated from all the others, and the VM with ID finishing in 97eafa2795da listed by their own. All other processes are to be grouped together by using the basename of the executable. The same applies to the regular expression for the mysqld process. Let’s restart the service, so that new changes apply, and we will check the graphs after five minutes, to see new changes. Note that you may have to reload the page for the changes to apply. Agustín joined Percona's Support team in December 2013, after being part of the Administrative team from February 2012. He has previously worked as a Cambridge IT examinations Supervisor and as a Junior BI, SQL & C# developer. He is studying to get a Computer Systems Engineer degree at the Universidad de la República, in Uruguay.